Jenay Dupuy Franco and I met our husbands–who are brothers–the very same summer up at camp. These days, we are both stay-at-home mommies to a pack of gorgeous Franco grandchildren and wives to two amazing Franco men. Jenay was one of those girls who couldn’t wait to be a mom. When her babies finally arrived, though, her experience wasn’t the idyllic one she had always dreamed of. She and her husband Chris had to move hundreds of miles away from all of their family and friends for his medical residency, and then they had an unexpectedly rough start in the NICU with their first baby. After a couple of years of struggle, including a long, hard journey through postpartum depression (much of that time undiagnosed), Jenay eventually made her way back to mental, spiritual and physical health with the help of Christ…and her running shoes. Jenay’s episode is about hope. She has practical wisdom and a powerful real-life story to share, and I think that listeners will experience some of those “you too? !” moments that remind us that we’re not alone in our struggles, especially the very real, very common, and very difficult struggle that is postpartum depression. 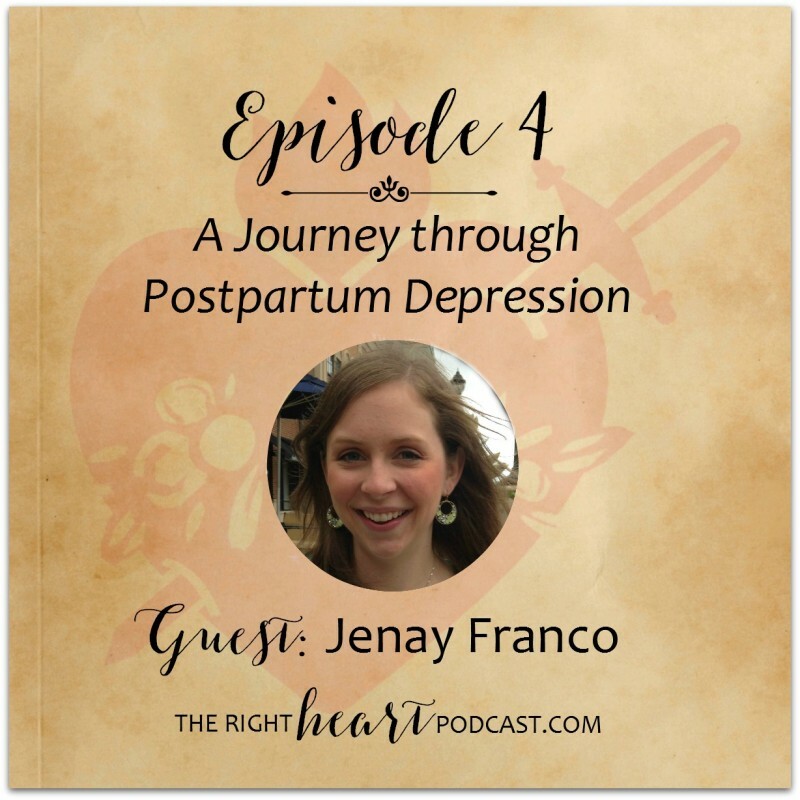 Jenay and Erin, I really liked how you talked about how these experiences brought you, Jenay, to a happier and healthier and holier place as a woman and as a family than where you were even before the depression happened. You gave good advice even for those who haven’t been through the exact same experiences. Maybe being aware of some of those things can help women before they end up in such a difficult place. So many women nowadays live far from family, and I think we ought to perhaps look out more for those who might be alone and thinking they just need to grit their teeth through hard times. A little reaching out might make all the difference to someone. Thank you for sharing. I just wanted to let you know how grateful I am for your podcast, it was a huge eye opener for me. I have been feeling the same things you were Jenay! My daughter is 12 weeks old and I have been struggling with my feelings, but I wasn’t really sad, per say, so I never thought of PPD. But I have truly just been angry and incredibly irritable all the time. Like yelling at my 3 year old for putting his cup in the wrong spot and getting mad at a helpless infant for waking up when I put her down! I figured it was just me being tired and stressed from our new life as a family of 4! But after hearing your story I realized that there was more to my feelings. And I just read the post you mentioned from Jenny at Mama Needs Coffee and her list is EXACTLY what I am feeling! I have called my doctor and plan on talking to him about doing something to get my feelings in check first and foremost and I am going to find a counselor to talk through all of this. I probably would have just continued to struggle with my feelings thinking I should just deal with it! Keep up the wonderful work Erin, you are truly making a difference in peoples lives. Wow–so blessed to read your comment, Kaitlyn! So glad that you’re taking some steps in a good direction. Praise God. Thank you so much for your comment and for your kind words about the podcast, too! Peace be with you and yours! This was a great episode!! Love you girls so much!! I should also mention that it was this article I read by Jenny at Mama Needs Coffee (http://www.catholicnewsagency.com/mamaneedscoffee/2014/03/oops-it-happened-again/) that gave me my first glimpse of hope in a dark, dark place. THANK YOU, Jenny, for being so open and honest about your struggles! !